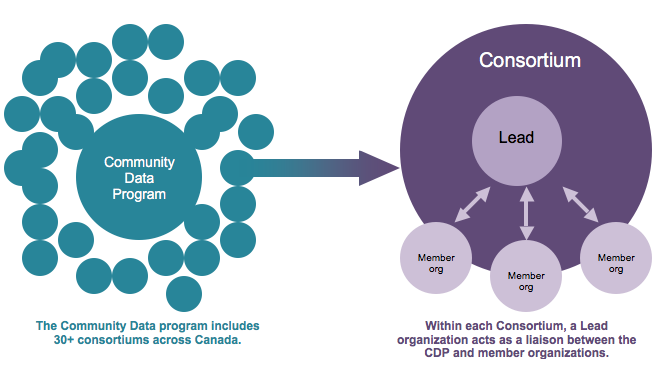 CDP member organizations are part of a local Community Data Consortium, a grouping of organizations operating at a municipal level and “focused on the implementation of a public service goal”. (See Who’s a Member) The boundaries of a consortium correspond to the consortium member with the largest sub-provincial service catchment area. The CDP’s consortium model is an innovative tool for fostering multi-sector collaboration and strengthening local networks and relationships. The consortium model attracts diverse organizations interested in reducing the costs of acquiring credible and timely customized information to tell their communities’ stories. These organizations share a common mandate to identify, address and track community-based social development priorities. Each Community Data Consortium is led by an organization which assumes responsibility for entering into a Memorandum of Agreement with CCSD and maintaining communication with the consortium membership. Consortium Leads are typically municipal governments, but consortia can be led by community sector organizations. Lead representatives ("Leads") serve as the liaison between their Data Consortium and the Community Data Program team. Leads meet face-to-face on an annual basis in the Spring and via teleconference in the Fall. The Data Purchase and Access Working Group (DPAWG) helps the Community Data Program management team identify data needs, improve data access, acquire data, and address related technical concerns. The Training and Capacity Building Working Group (TCBWG) helps the CDP team by submitting and reviewing ideas to improve the training and learning tools provided by the program, to increase the capacity of the membership to make use of the data and to produce research products, and to improve the website to support the work of the membership. Governance of each community data consortium reflects local realities and needs. With over 30 consortia in place, new consortia benefit from a wide range of experiences, tools, and approaches to starting up and running a local consortium. These consortium governance resources include results of the CDP annual user survey, results of the consortium leads survey, templates and tools used by consortia locally to run their consortia.